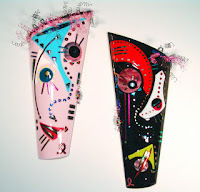 Little did Chicago glass artist Laura Thompson know that when she attended the 2011 "Lunch with Friends" fundraiser, she would find inspiration that would change her both personally and artistically. 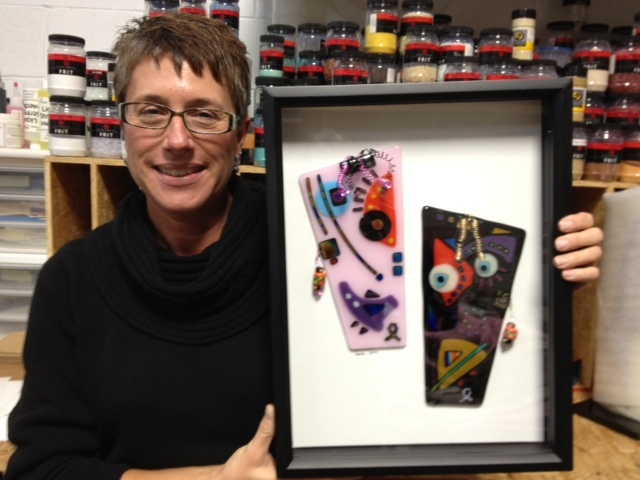 Originally, Thompson and fellow-Chicago glass jewelry designer Amy Odom were asked to create a special thank you gift for the event's co-hosts, Robyn Scott and Colleen Murray (from Chicago's Second City Improv). Thompson and Odom were also asked to attend the fundraiser as guests of board member and good friend Donna Emley. 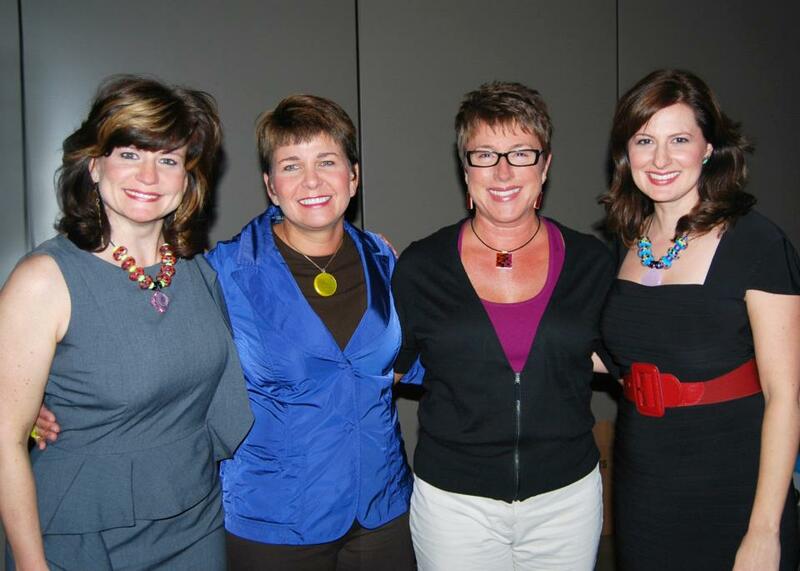 Thompson was completely inspired by the program, the stories, and the 500+ women at the October event. She also toured the coach, and at the age of 47, had her first mammogram - something she had put off doing because of both hesitancy about experiencing a mammogram, and also a change in her insurance. "It was such a positive experience!" explained Thompson. "My creative juices just started to flow - and I thought - I have to do something to give back to this group and pay it forward at the same time," she continued. 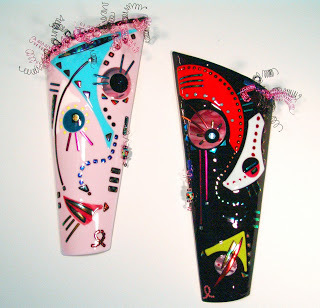 The two masks depict both the darker side of the emotions that a woman might feel and face after she learns she has the disease, while also reflecting both the acceptance and positive emotions of strength, hope and courage that eventually emerge as she moves into the "I'm a survivor" mode. Thompson created "Faces of Breast Cancer" and debuted the masks in late 2011 at the juried Festival of the Masters at Walt Disney World in Orlando, FL. These stunning pieces of artwork continued to travel the art show circuit in FL and TX; finally finding homes in the fall of 2012. Thompson had already ear-marked a portion of the proceeds of the sale to Francine's Friends to help pay for screening mammograms for women who couldn't afford one. But the story doesn't end there. Fast-forward to January 2013. Thompson strikes up a conversation with a woman at her health club - Britta McKenna - who is a breast cancer survivor. McKenna journaled during her diagnosis and treatment, and was inspired and encouraged to create BreastCancerMyStory.org — an official online journal/resource "to provide online companionship and relevant information for all those affected by breast cancer.” The two women became fast friends, and McKenna asked to interview Thompson about her experience. At the interview and studio visit, McKenna found that Thompson had created a smaller version of the "Faces of Breast Cancer" as a gift to Mckenna - to "represent what Britta has gone through as a survivor and also to acknowledge the work she was doing with Breast Cancer MyStory" (read the complete story here). The two women are continuing to think about more ways to create something meaningful together — and more importantly, to continue to touch the lives of other women. Click here to learn and read more about Britta McKenna and BreastCancerMyStory.org. Click here to learn more about Laura Thompson and Savanah's Designs Glass Studio.